If there is one thing I learned from reading a lot of Junji Ito manga, it’s that fish are absolutely horrifying. They are ugly, weird, and if you go deep enough you’ll find species that simply exist in this world to be nightmare fuel. 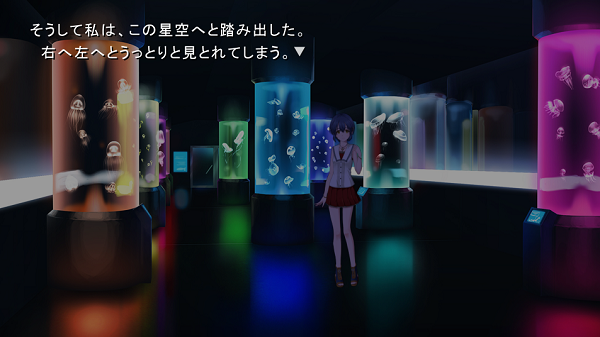 That is why Shizuku no Oto immediately drew my attention, as it’s a horror visual novel set in an aquarium. The title roughly translates to Sound of Drops and the story goes that a rumor is spreading about the aquarium, which suggests that the fish are actually human souls that linger in this world. Two middle school students, Mayumi Nakanobe and Himeno Tamagawa, make a visit in order to investigate and end up finding more than they ever bargained for. The visual novel has been licensed by Sekai Project, a company responsible for bringing a lot of great visual novels to western audiences, particularly through Steam. Among their biggest projects is the licensing of Clannad and the Grisaia franchise. While it remains unconfirmed whether or not Shizuku no Oto will also come to Steam, I think it’s a safe bet it will; we have reached out to Sekai Project for clarification and will update when more information is available.